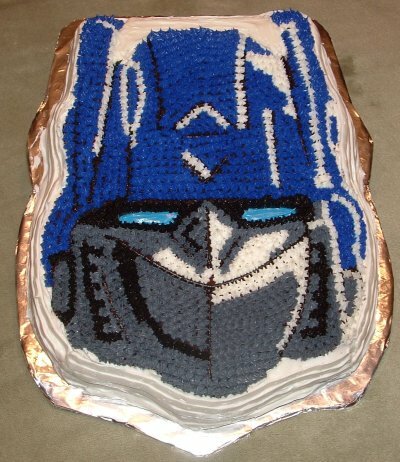 More than meets the eye … with this Transformers cake. I kept giggling while making this cake because I kept wondering which way was up. I think that the cake turned out well because my son and his friends were thrilled when they saw it. I used the Wilton Transformers cake pan to create the shape. I used the cardboard and tinfoil trick to create a base for the cake (trace the shape of the cake onto cardboard, cut it out and cover it with tinfoil). And then I still stored it in my large cake holder for in the refrigerator. I made the cake a chocolate cake because my son loves chocolate cake and the icing is mainly dark colors. I sprayed the cake pan well so when it was cooked it just slipped right out. The cake then cooled on a cooling rack and then I placed it into the refrigerator to make the cake really cool. When it was completely cold I flipped it over (so the top was down) and I cut the bottom off the cake with a serrated edge knife making the cake bottom flat. I flipped the cake back to the right side on my cut out base. Next, I slipped waxed paper under the cake before I iced the cake. I tore small pieces (of wax paper) that were maybe about 2 inches by 4 inches. Then I iced the cake. I used the tips #3, 16 and 47. First, while icing, I iced the outside white with a spatula. The chocolate crumbs were mixed into the icing, but I knew I would clean that up after icing the top of the cake. Never worry, your cake creation will always turn out in the end. I used the #3 with black icing to line the shapes on the face (I mixed chocolate icing with black dye). Then I used #3 again with Royal Blue dye to create the eyes. After I piped the eye I wetted it down to make it smooth (try water, cornstarch and your finger). After this I used the star tip (#16) for the rest of the face. I used again the black, blue and grey icing (I made these colors with vanilla icing). I had purchased the Transformers Dye kit from Wilton so I had the right dye colors. Finally, I had to fix up the white icing on the sides. I looked at all my tips and decided to use tip #47. With the white icing I made white thick (masculine) strips around the outside that were vertical strips. I was so relieved that it covered so nicely, completely covering the chocolate cake. To finish, I just had to slip out the wax paper from under the cake – this kept the base clean through the icing process. The boys were thrilled and truly enjoyed their Transformers cake!